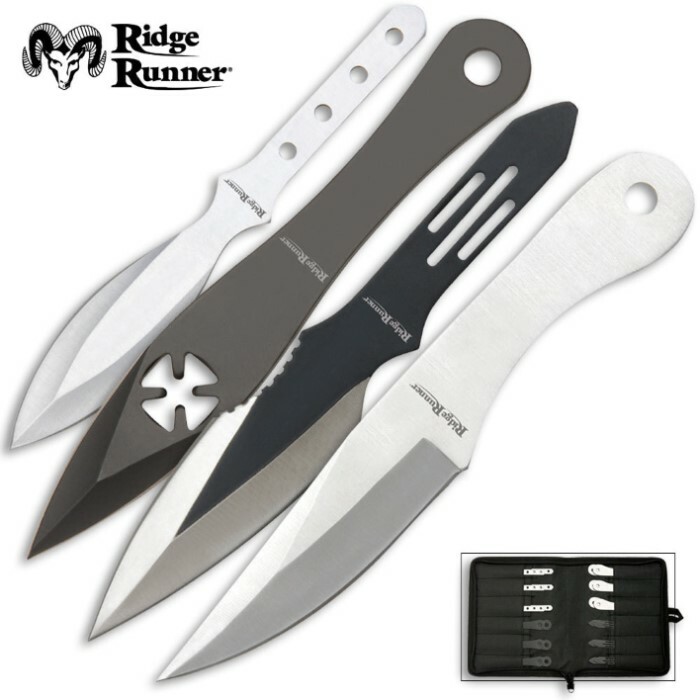 Overall length for each: 5 3/8"
This amazing throwing knife set offers 24 full-tang knives with four different unique designs. It's a great set for throwing knife enthusiasts and knife collectors alike! Each thrower is made of one solid piece of stainless steel and is 5 3/8" in length. A roll-up nylon sheath holds all of the throwing knives. This great deal is only available for a limited time, don't wait, order now! I don't know how often I've read "And you can't beat the price.," in one of these reviews. In spite of that, I'm going to say, You can't beat the freakin' price. I've bought four of these sets as gifts to friends who don't know the distinct pleasure of hearing "thunk" and seeing a fistful of blades in a tight circle in a target on the other side of the room. I live in a South Philadelphia rowhouse with a mancave\office on the third floor that has a 2 and-a-half foot square white pine target in the middle of floor-to-ceiling bookshelves. These are perfect indoor throwing knives. from a seated position in the eight-to-nine-foot range. When I need a break from writing (or buying knives) on on the computer, I can swivel my high backed office chair and thunk away by the dozens. No knives were harmed in the writing of this review. I bought this on sale for $10 dollars. If I knew ahead of time this was this good I would order 2 of them! They are sturdy. The Black one with the cut out is really strong Considering there is a comparatively large hole in it. Not my kind of knife. Small for combat, but nice for playing with while camping or just playing around. Lots of them to minimize your trips to and from the target. Might loose some in the weeds, but at that price you wont loose sleep. Nice set. I bought two of these during a bogo sale. For the lrice, I couldn't say no. I haven't thrown them yet but I'm impressed with what I've seen so far. These little guys look and feel great. The case that came with them seems well built and the knives arrived with a decent edge. They exceeded my expectations I can't wait to get throwing! Beautiful. Initially, I was surprised by the size of the knives, but after seeing how amazingly they threw, and the beautiful design, I forgot about it immediately. Well worth the cost, in fact, it's almost a steal. If you are beginning knife throwing, buy this. Just received these knives a few hours ago and took some time throwing each type for about 20 minutes each. Right off the bat when I opened the folder they came in (which is handy by the way) I was surprised at just how small they are. Thankfully this did little in affecting how they preform, as I'm able to land them decently a majority of the time. I would recommend sharpening the tips of the chopper cut out and arrow thrower knives however, as they were very obviously the weaker of the 4 knives. They still landed most of the time however. The two tone and professional both preformed exceptionally. All in all this is a decent purchase for someone who is looking for small throwing knives they just want to screw around with while camping or for beginners who aren't completely committed to buying extremely high end throwers. The high knife count of 24 blades isn't a small one either! Definitely worth the price. these are great little knives you can stash away in your bug out bag to use as spear points, repurpose to make fishing gigs, and to just have around for utility purposes. can add cordage to handles, make your own neck knife.... at about a buck a piece they're versatile and sooo cheap, tried throwing them and got them to stick but they are small and light and bounce if you're off your game. I say buy them use them for anything except throwing. These knives are pretty cool and a whole lot of fun. Unfortunately I did not read the description fully and was very surprised to find out how small these knives are. It's my own fault. If you are looking for a kid size set of throwing daggers then this is the set for you.